This is the first time I've had any time with the Solaris since NAMM...and, sadly, I only get to enjoy it for a few days. It's at O.S. version 0.8 now and there's been some solid progress...there are lots of features active and present that were conspicuous by their absence when I demoed it for folks at NAMM. Just a ton of stuff is now implemented. I'm extremely jazzed - This is very quickly turning into my favorite synth! There will still be a bit of a wait for the production model...after a slow start, Sonic Core had to finish up some of their own stuff first before turning their attention back to the Solaris. John is justly proud of his baby and is working like crazy to get it finished in a timely manner. It's a blast to program with this knobby/visual interface! Everything is right at the top, no menu diving. No mod matrix either - If I want to add modulation, I just go to the destination on the control panel, select a mod source and dial in the amount. This tune is mostly PPG-style wavetable patches. The droney bass thing throughout is a wavetable patch, so is the "plucky" sound throughout and also the weird sound at the two breaks that have a pitch-up at the end. The background string pad is a simple "multi-saw" pad using just two oscillators - each multi-saw osc is equivalent to seven detuned saws with detune amount being a mod destination. The synced lead is very nice - John has tried to get the sync to sound as close to a P5 sync as possible - there's some one-to-one wav file comparisons of that in the forum section of his website. Since there are no strictly "VA" patches in the song, other than the sync lead, it won't sound particularly "analog" though the Solaris excels in that area too, I'll see what I can do, time permitting, to portray its VA personality...or maybe something a bit "darker". 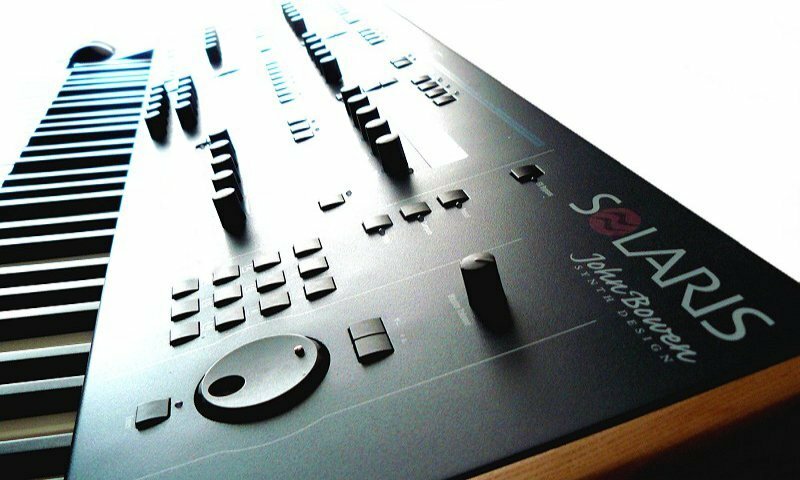 Once again, in my song the drums are Electribe though, when the Solaris ships, there will be sample playback as well that you could conceivably stuff with drum hits. However this beast won't really be a "rompler" per se but, in a pinch, it may be all you need. If you want sound samples unadulterated by MP3 compression and artifacts, go check out the examples over on John Bowen's site http://www.johnbowen.com/ - There's some on the main "Solaris" page and many more in the forum. It looks like things are on track now that Sonic Core is on the ball again. There'll be another prototype (with the vector joystick and some other notable physical changes) before too terribly long but, in the meantime, the O.S. has been progressing in a really thrilling way! UPDATE: Well, I had to give it back, John had just received a new OS for it. ...so, anyway, I wrapped up the thing I was working on with a metallic plucky lead and a few snippets of piano from the Nord Stage. I would like to hear some more filter sweeps as well, some sharper attack and some evolving textures, which is what its all about isnt it? Its the machine from heaven, and your style of showing it off is my cup of tea, but honestly, give it some decency! do CEM filtering! Do Vector! Do Envelopes! OSC MOD! PLEASE!!! Give it a fair job! If I'm blessed by a little more time with this beauty, I'll do some nice evolving/hybrid stuff. Best interface ever, for the best digital synth ever... cheers! Thanks for the review and for your song carbon111. 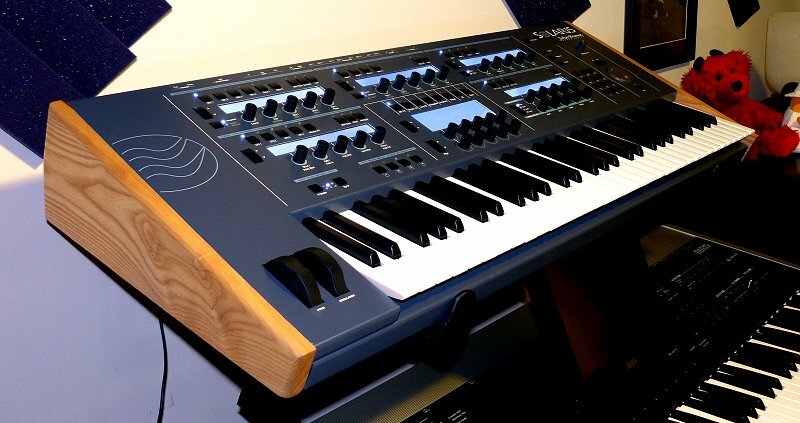 The Solaris is evolving into such a beautiful synth!!! I would like to hear the pads and ambient spacey sounds that I like to use for my TranZenmusic for meditation. It's been fun watching it's development. It sure is an amazing and wonderous time to be a synthesist. I had about 3/4 of the tracks complete - I'll finish it with my existing instruments and post it when I can.